Have you ever wished there was a way to show the value of the CPC by simply hovering your mouse over the bar in the overview chart? Now there is! The Keyword Report has been updated with widgets for price distribution (CPC) by country for the selected keyword, and a histogram has been added to overview, related, and full search reports. Take a look at the two histograms in the snapshot! The trend graph (to the right of the histogram) has become even more informative, as now when you place your cursor over it you are shown the value. You can also get the specialized report for one of the selected countries by clicking on the desired line within the histogram. You can use this information in an assortment of ways: to improve your keyword list, to find an exact phrase match, or to locate broad variants of keywords that are related to the search. Our testing so far has shown very positive results! We are constantly improving our products for the benefit of our customers. For this very reason, the header and sorting tables have been redesigned for your comfort and ease of use. You have the ability to sort a column by clicking on the arrow of interest or the entire cell. When you click the first time, a default sort of high to low is selected. By clicking again, it is sorted alternatively from low to high. 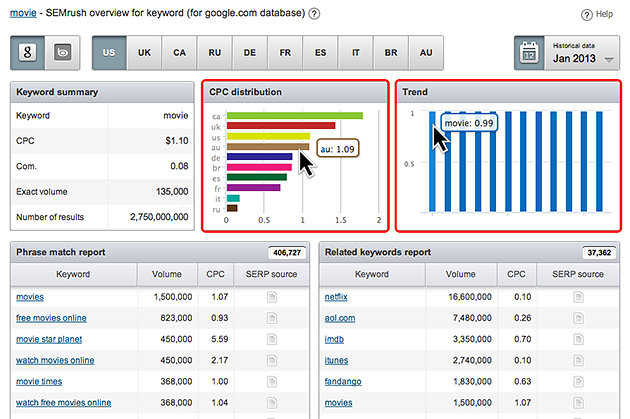 The number of columns that can be sorted has also increased on the (by organic) report. By integrating a myriad of options, we hope that we can simplify your use of our service and thus improve your work as a whole!